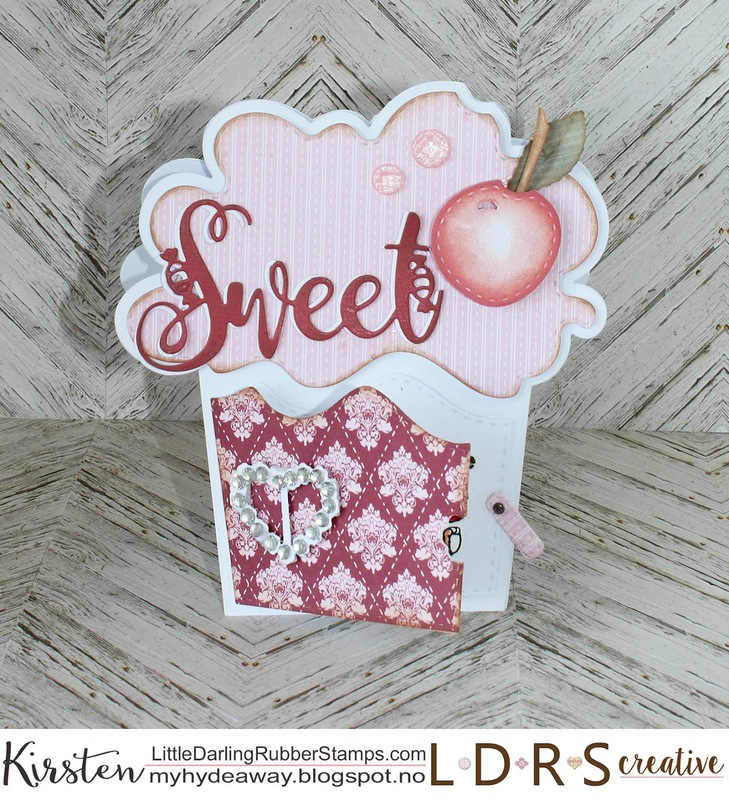 This is a card created with the sweet Cherry on the top - build a card die set. 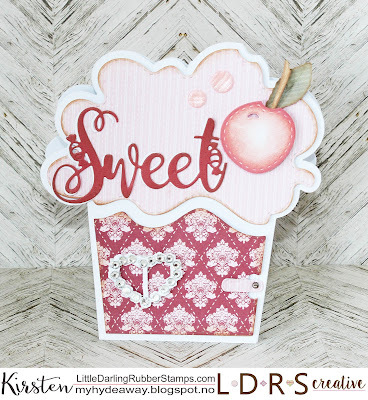 The card has been made with the sweet Sincerely Yours - 6x6 Paper. 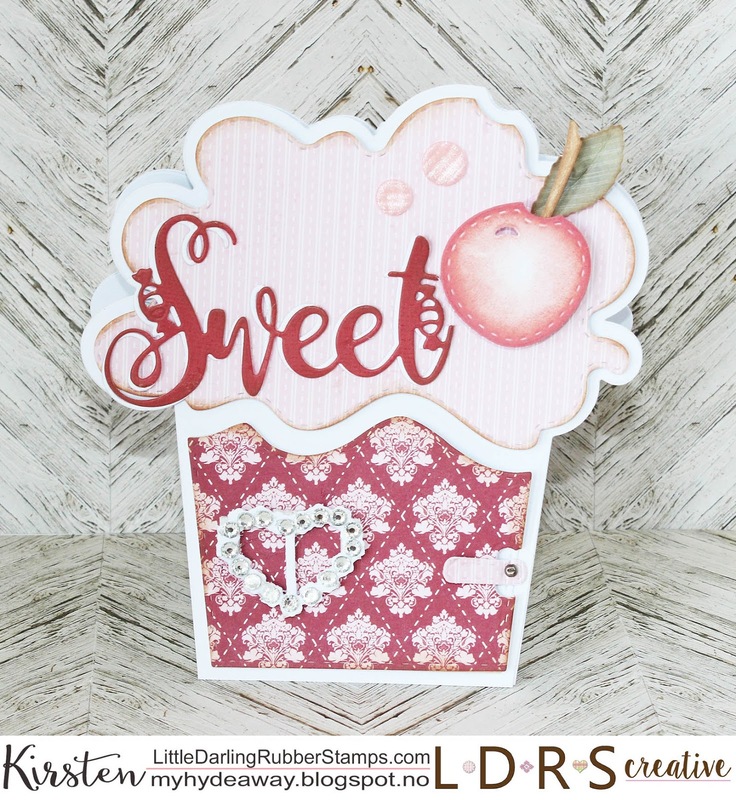 The sweet word has been dieset out in white and red cardstock with the Sweet die. 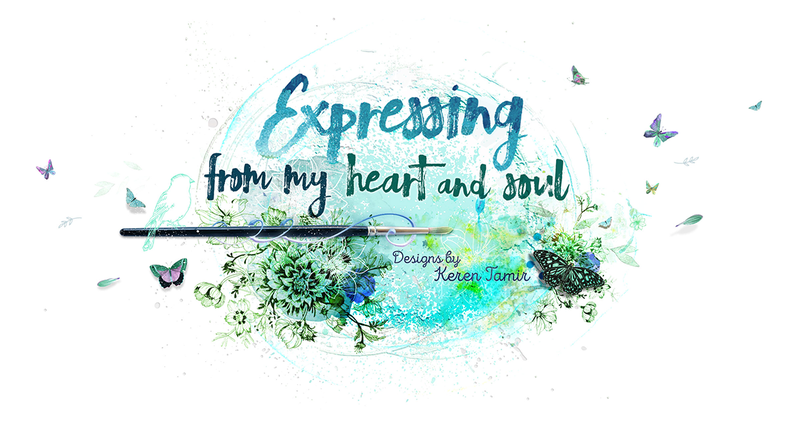 I have left a little space for a secret message. 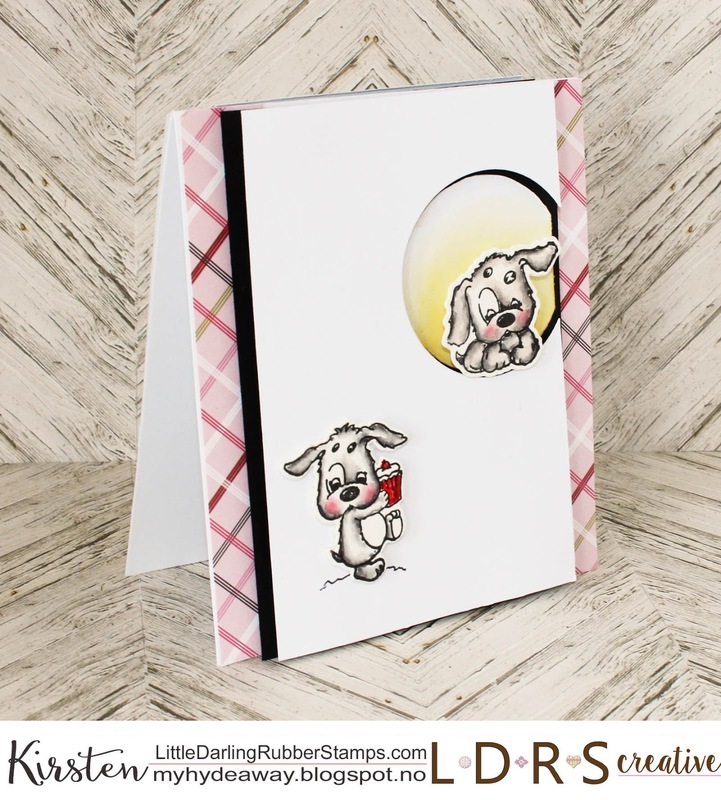 The little dog is from the Puppy Love stamp and die set. 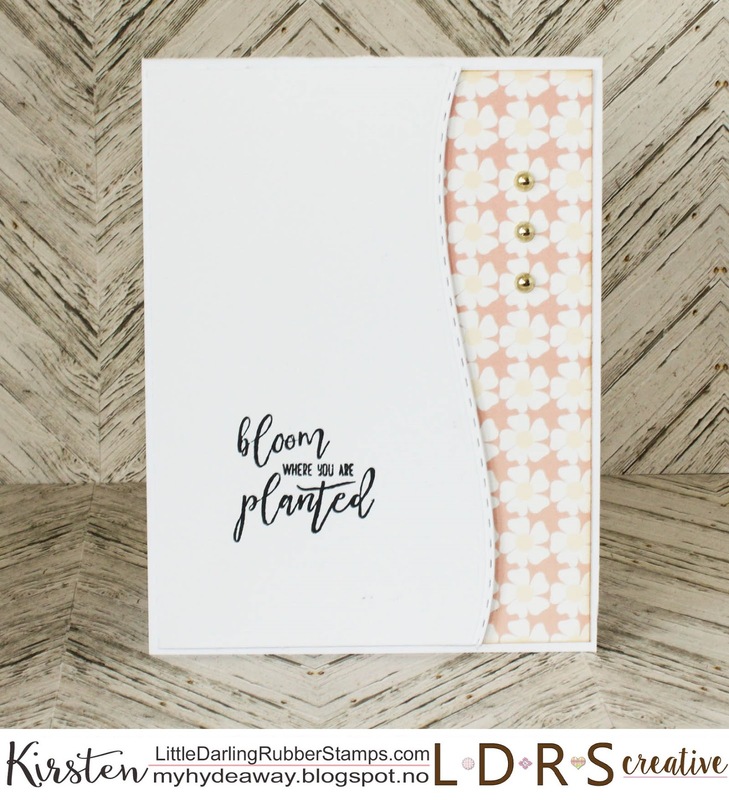 The leaves and flower stems have been created with the Super sprigs die set. 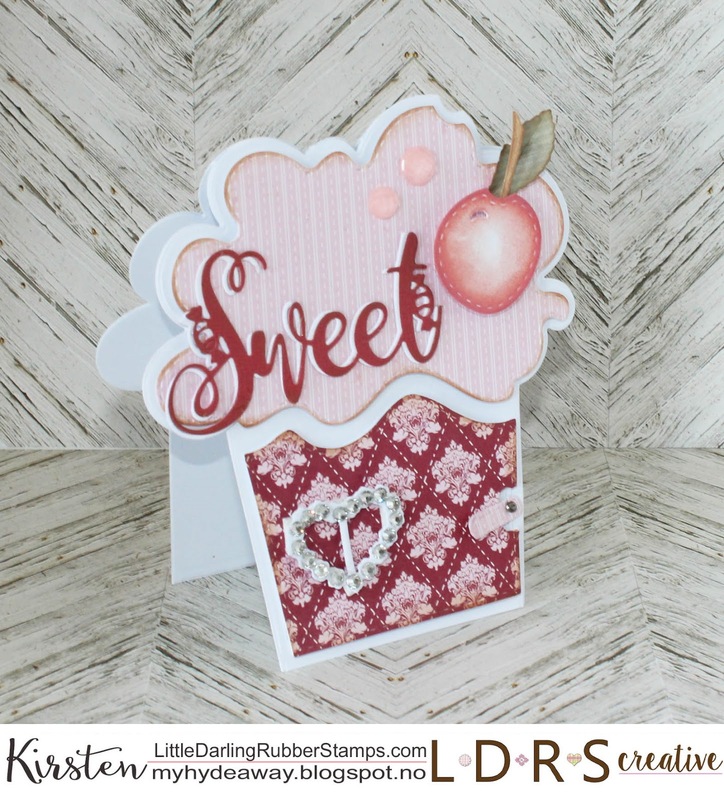 This card has been created with the sweet Mini Winnie Boutique stamp and die set. 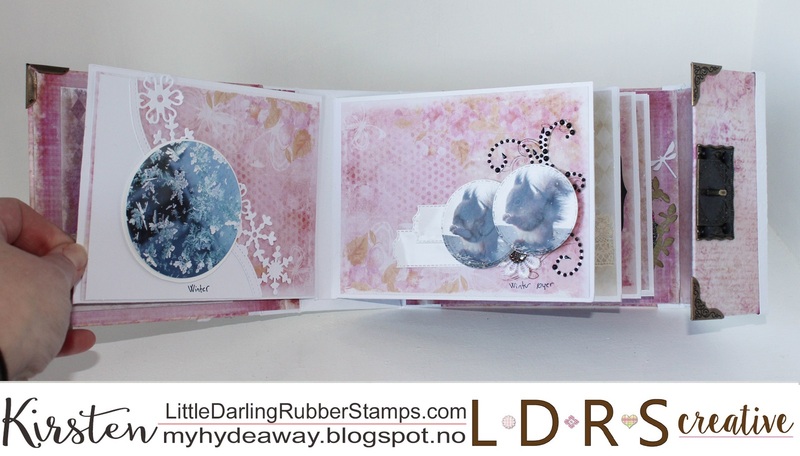 To create the circuar background for the card, I made a stencil with the Fancy circles die set. 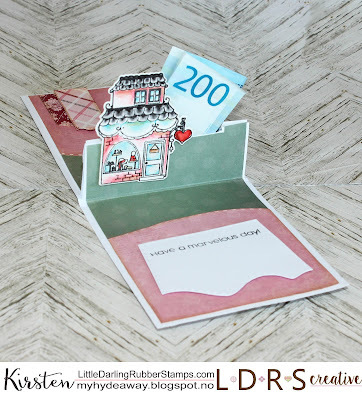 The inside of the card has space for gift card or money. 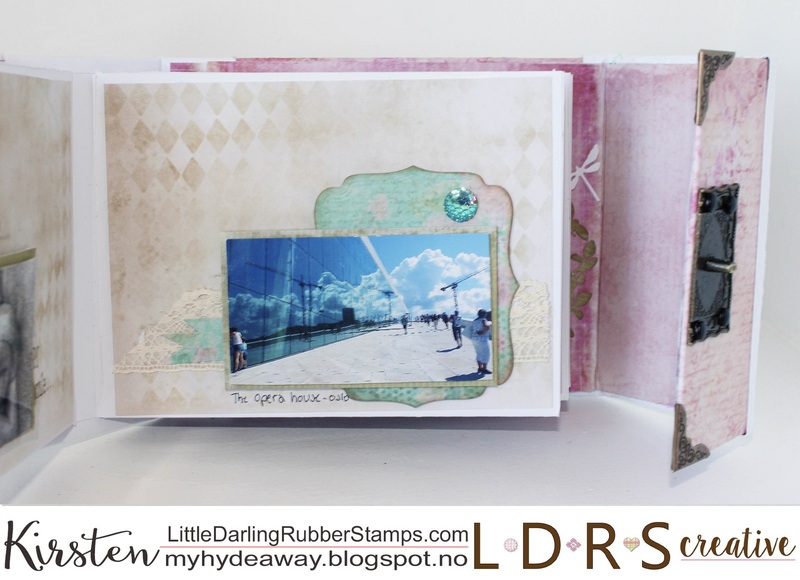 The grass boarder has been made using Basic Cutting Edge Borders I. 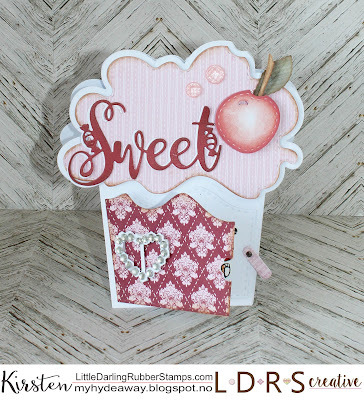 The white diecut with a space for a message, has been cut with a die from the Cherry On Top Build-A-Card die set. 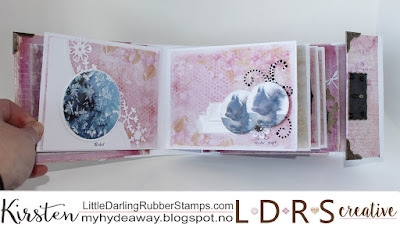 The banners at the top has been creted with dies from the Fancy Rectangles & Layers die set. 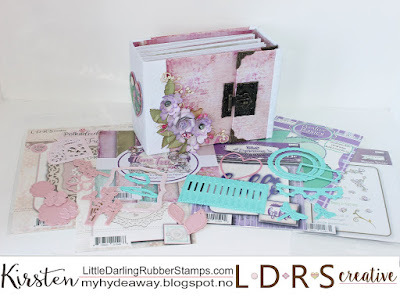 The papers used are from the Sincerely Yours and Time for Tea paper pad. 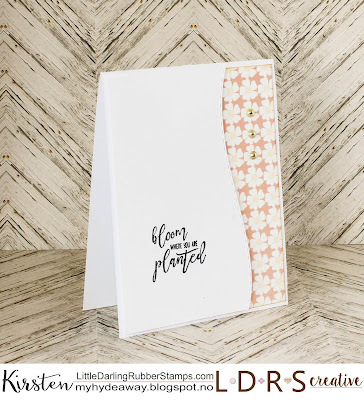 This is a simple CAS card created with a text from the Let Love Grow stamp set. 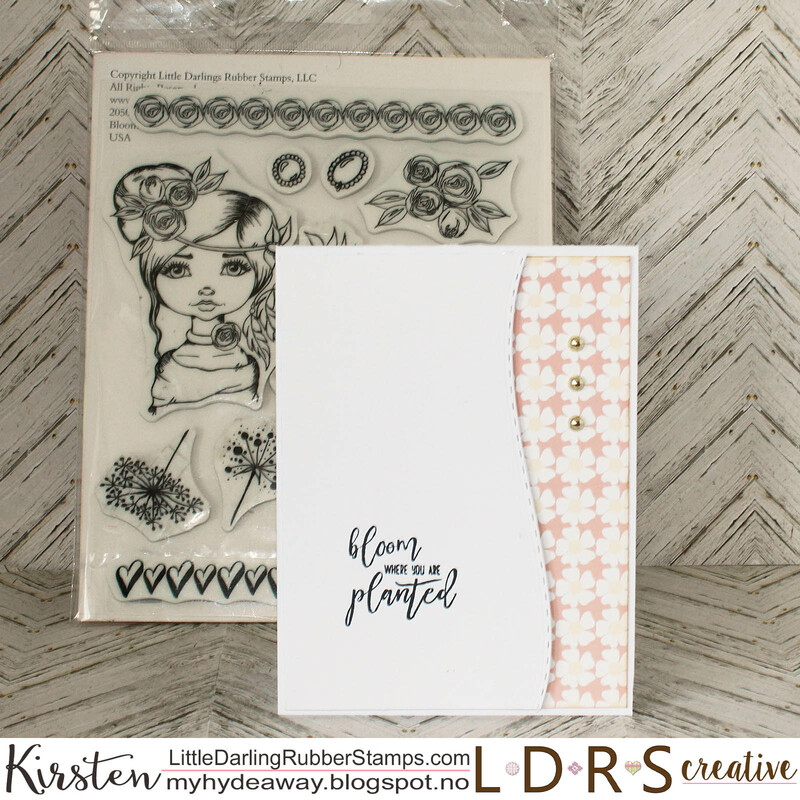 The boarder on the white cardstock has been created with the Basic Cutting Edge Borders I. The papers used is from the Pretty Perfect paper pad. 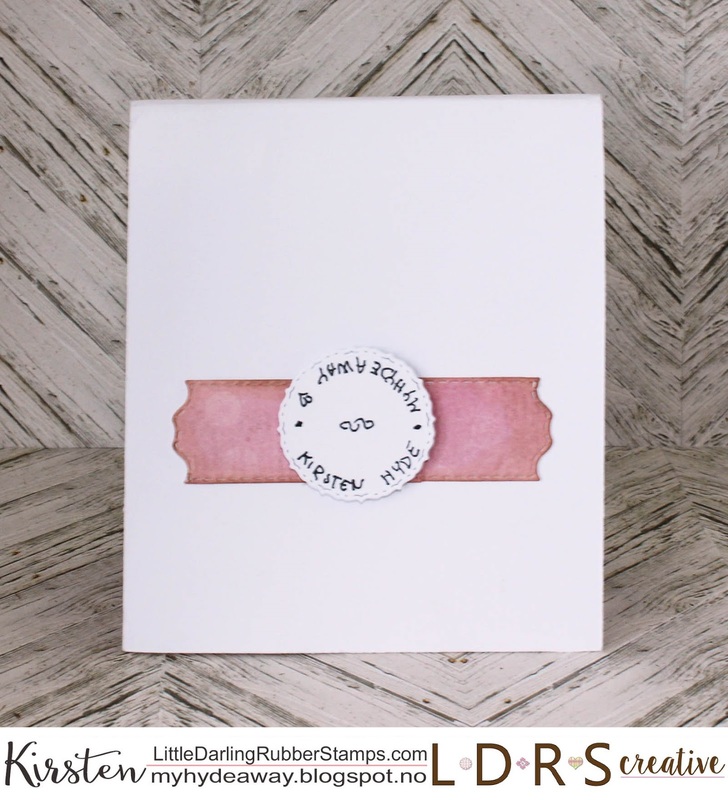 I also decorated the back of the card and used dies from the Fancy Rectangles & Layers die set and the Fancy circles die set. 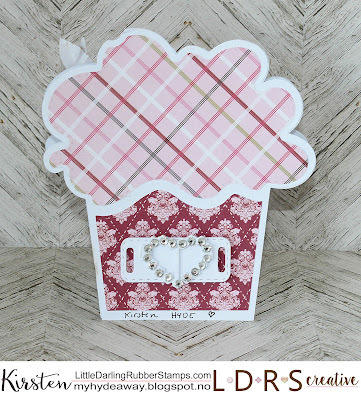 I created a card with the supersweet Puppy love stamp and die set. 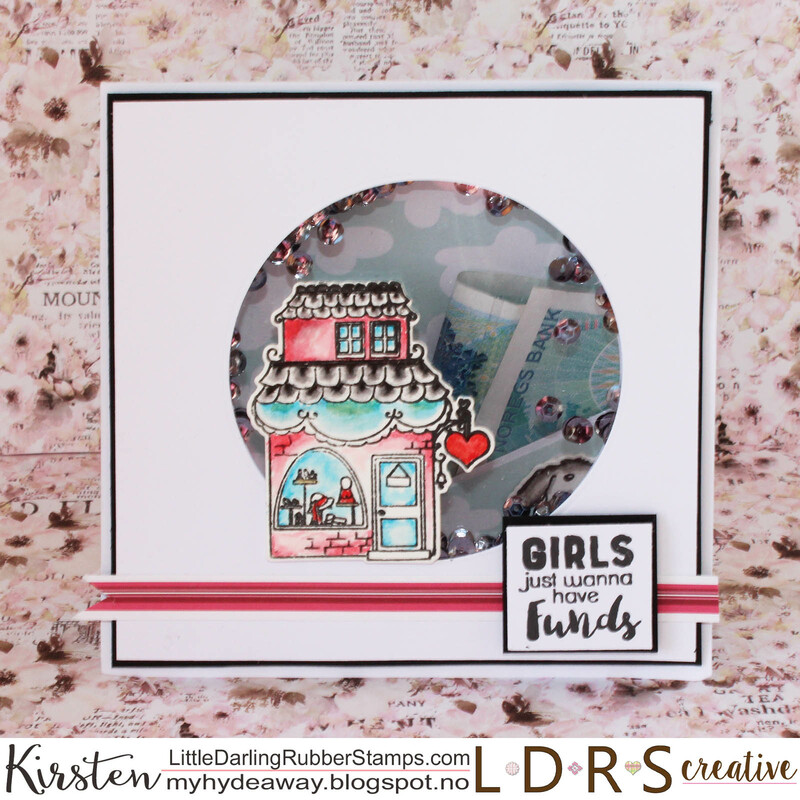 The circle has been cut out using the Fancy circle die set. 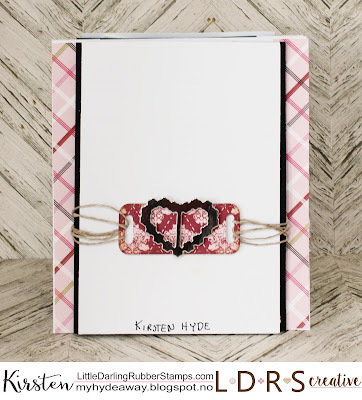 The papers used is the Sincerely Yours paper pad. 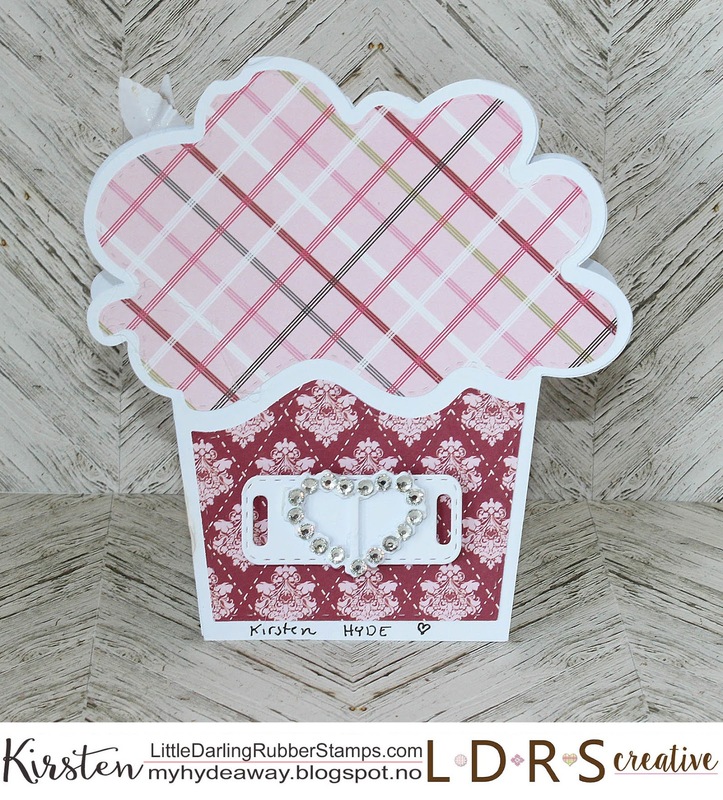 I also decorated the back of the card slightly with diecuts creamted with dies from the Cherry on Top Build a card die set. Small gifts are always popular. 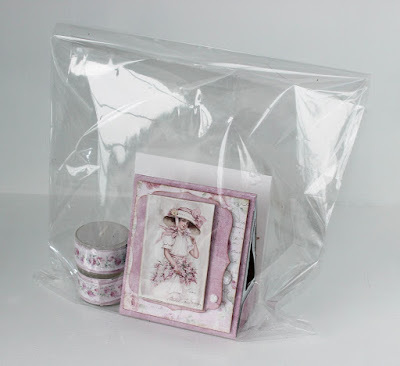 You can eighter give them away or sell them at markets. 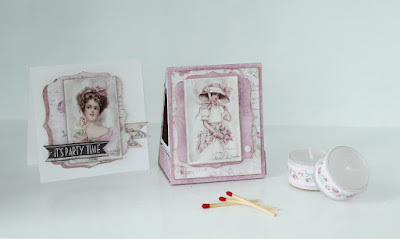 Here, I have decorated a match box, te lights and a card with Maja design's Sofiero collection and LDRS diecuts. The matchbox is a triangular matchbox, with a drawer at the bottom. 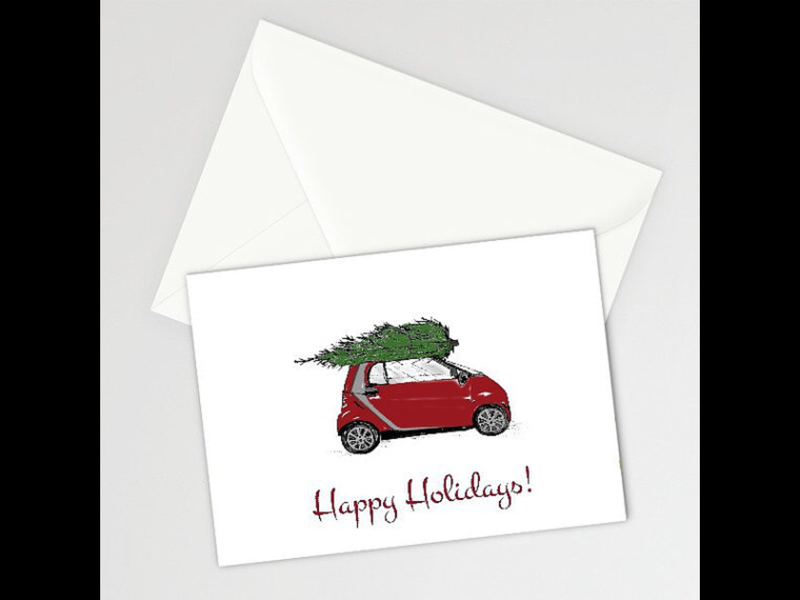 The base is in er White cardstock. The card has been simply decorated at the back with a banner, created by stamp and a Prima flower. 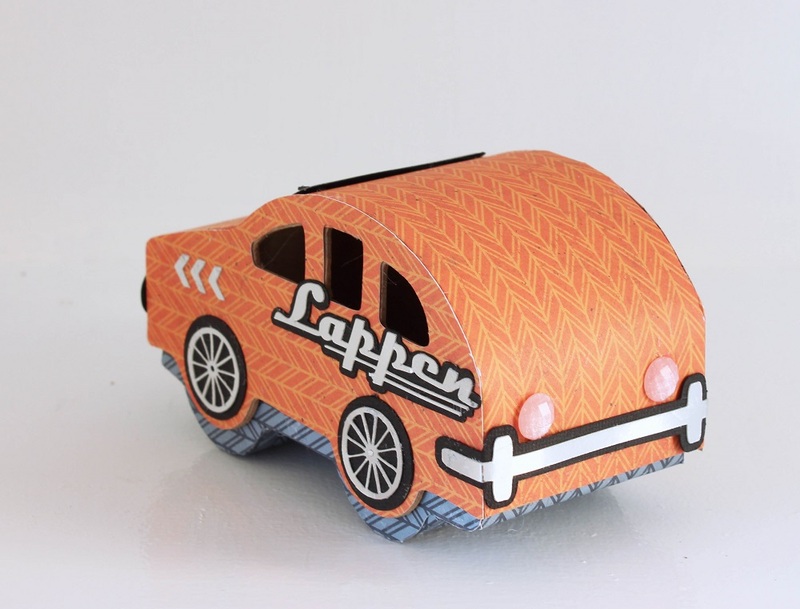 The papers are from Maja's Sofiero collection. 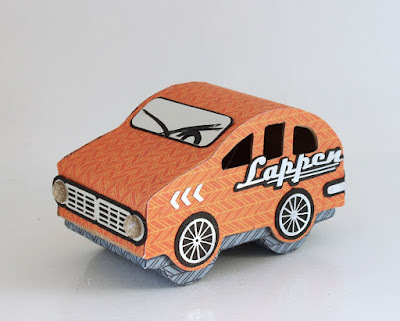 The motives are from the paper Sofiero - Ephemera. 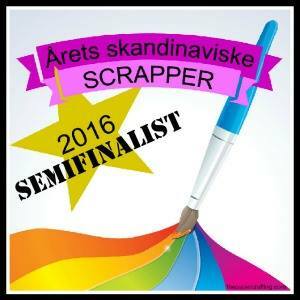 Bakgrunnsarkene. 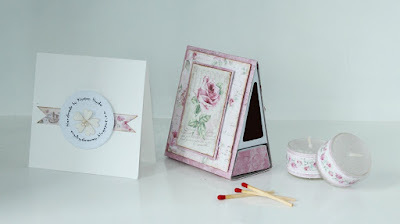 The other papers are from the same collection Strolling down the Rose path and - Enjoying the fragrance. The text, "It's party time" is from the paper Maja design - Celebration collection. 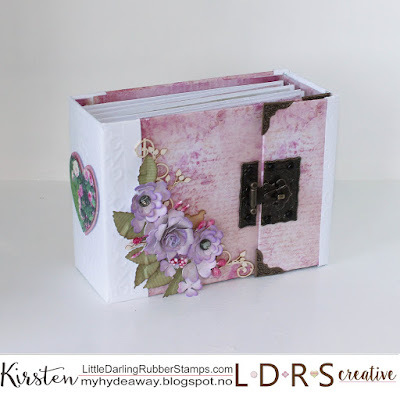 Here, I have also used dies from LDRS creative - Regal Frame Die Set. 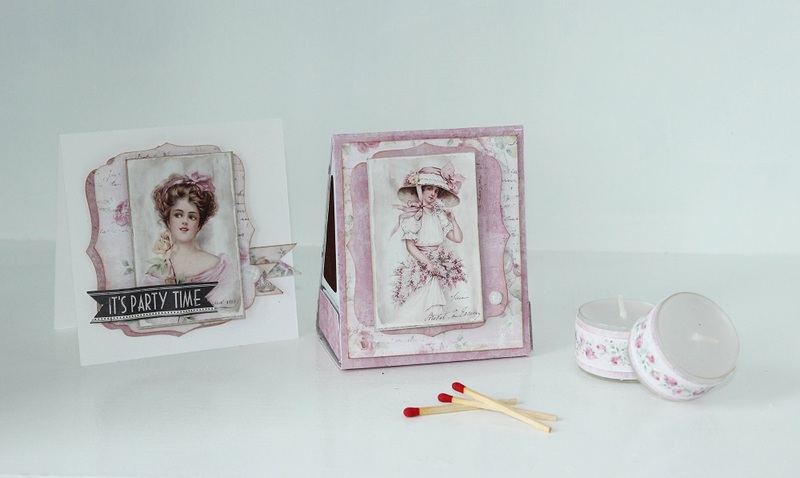 Tea light candles, match box and card has been wrapped in a clear bag as a gift. 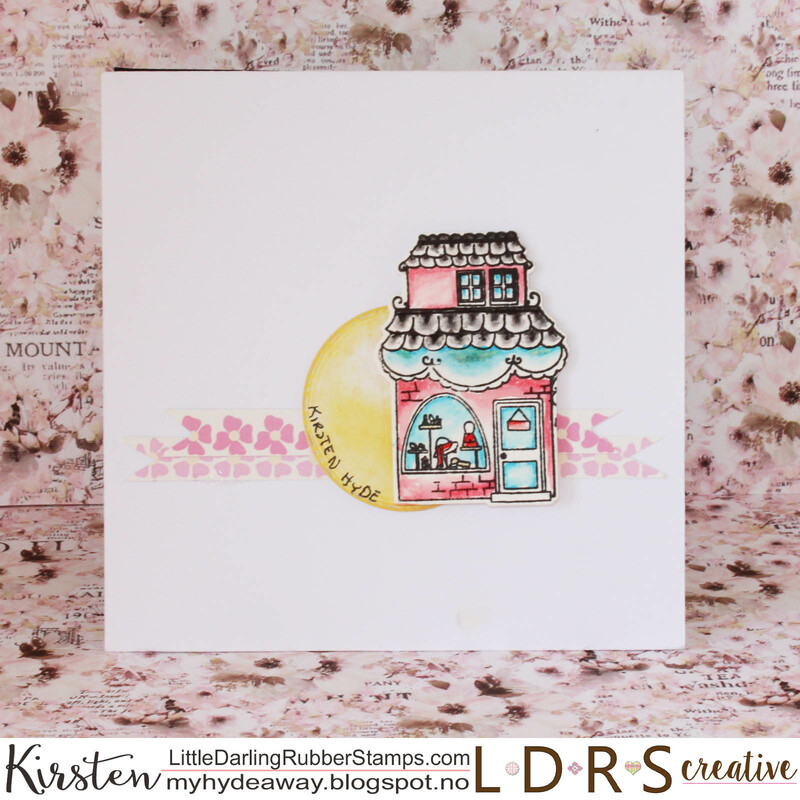 Today I am showing a card for LDRS creative. 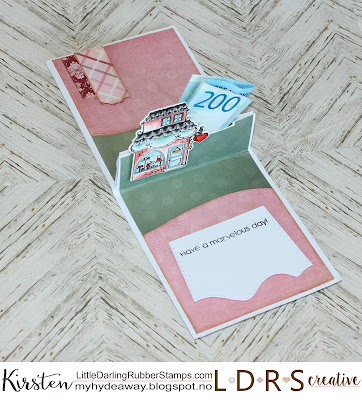 showing you a gift card with space for a gift card or some money. 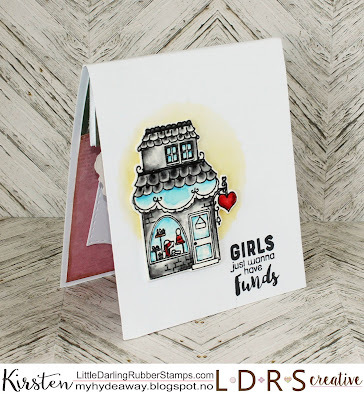 The card was inspired by the new Mini Winnie Boutique stamp and die set. 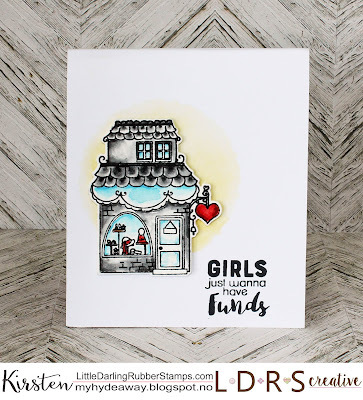 These adorable stamps are perfect for a card with a money gift. 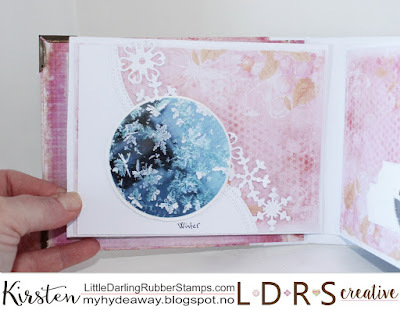 I also tested out the new LDRS creative ink, and it's fantastic with watercolours. 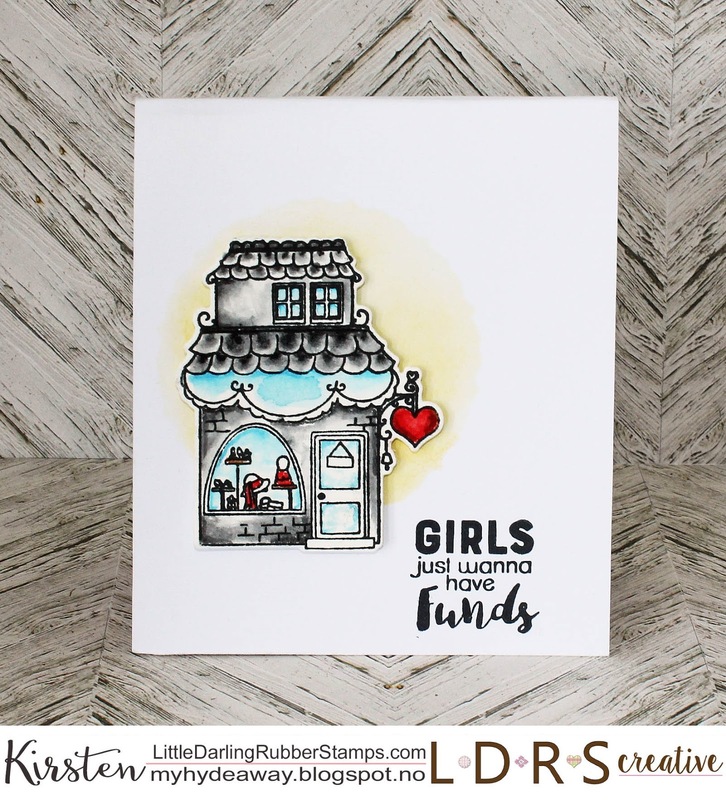 This is now my new favourite ink. 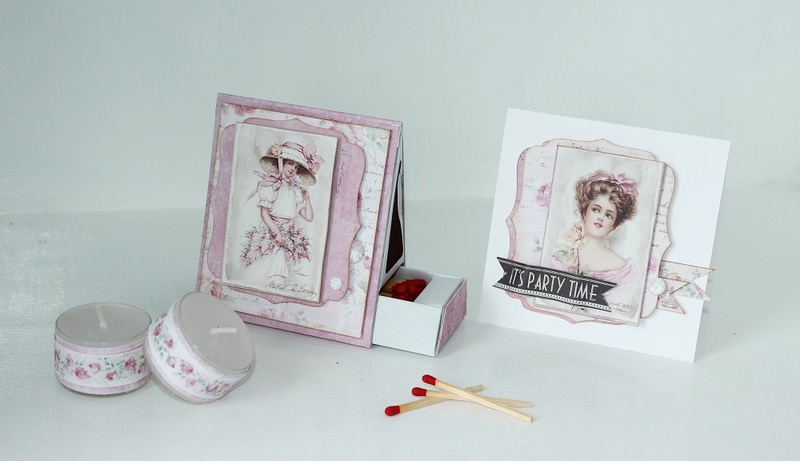 The card was made as a shaker card. 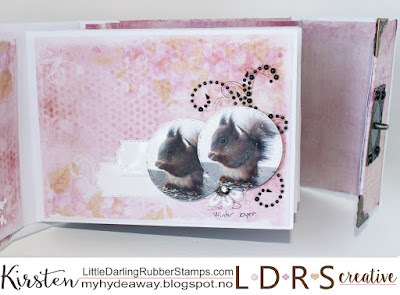 I used a circular dies from the Fancy circles die set to create the space for the sequinses. The pink stripe on the front, has been created with a strip of the Sincerely Yours - 6x6 Paper pad. 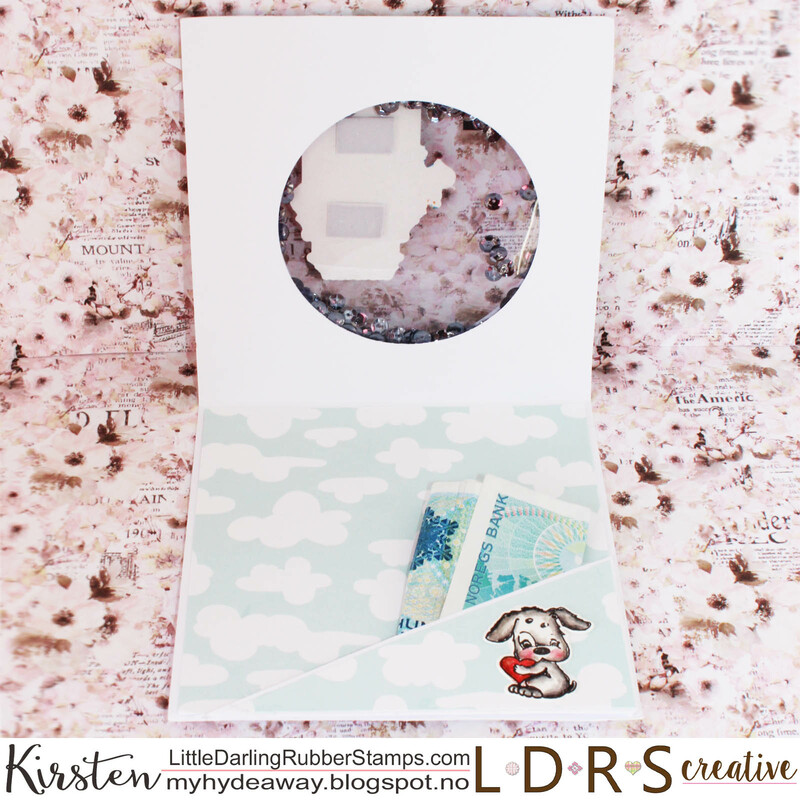 Inside the card, I used a paper with clouds from the Pretty Perfect Paper pad. 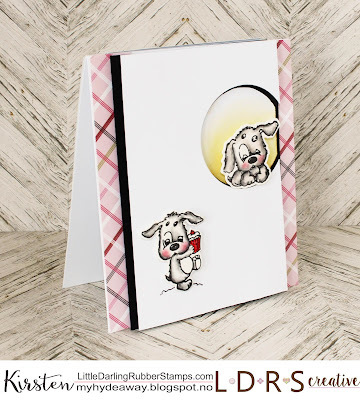 The little dog is from the supersweet Puppy Love stamp and die set. I just simply love these dogs. They are simple to colour and supersweet. 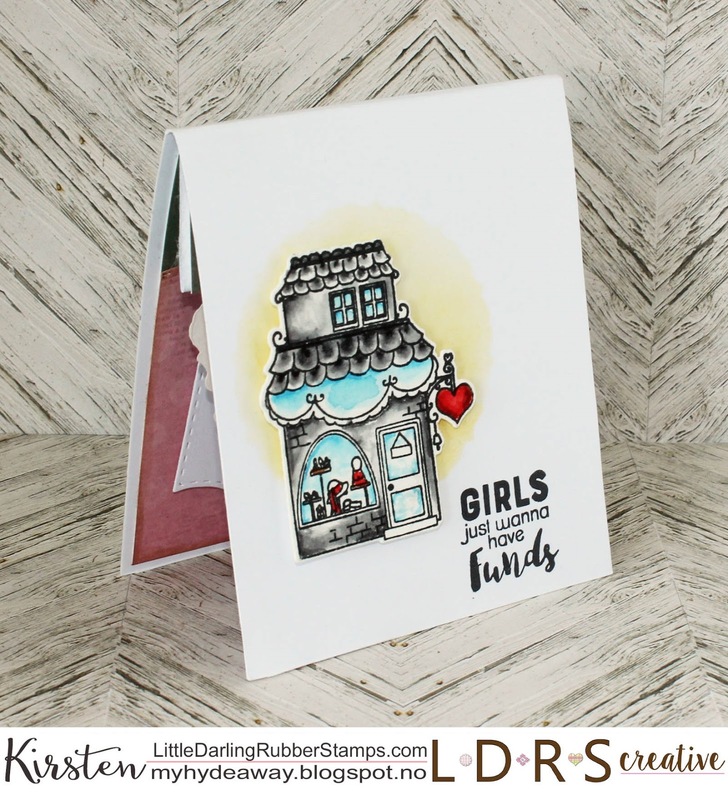 The back of the card has been decorated with another shop from the Mini Winnie Boutique stamp and die set. 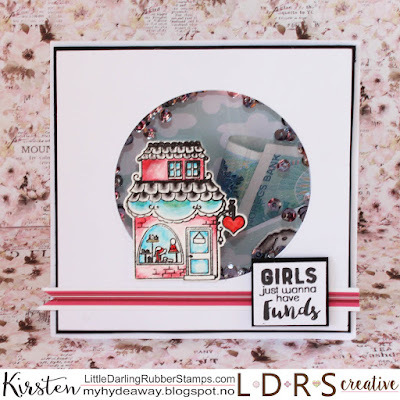 The little circle is from the Fancy Circle die set. 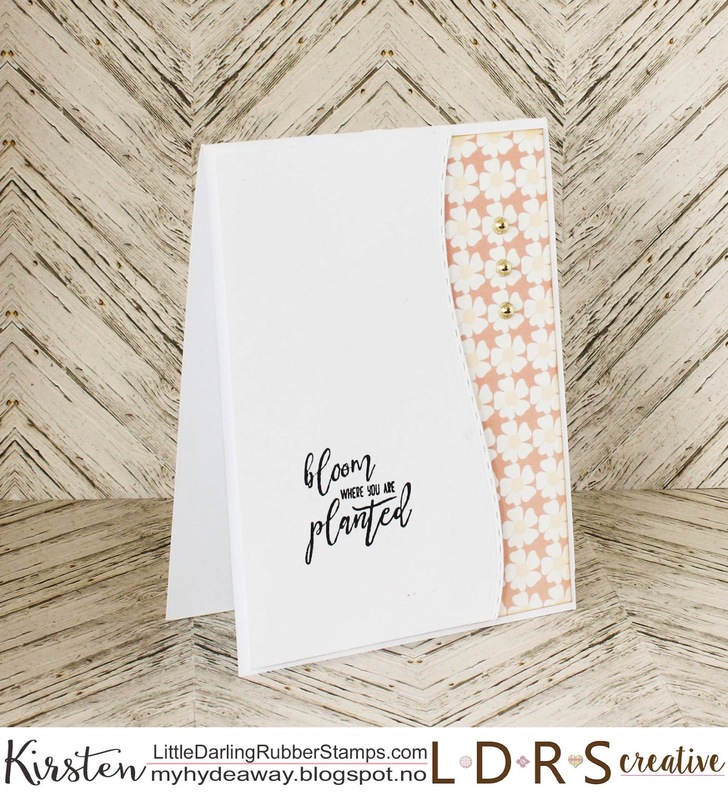 The stripes of flowers are from a paper from the Pretty Perfect Paper Pad. Enjoy the fantstic new products from LDRS creative. Ny dag og nye muligheter. 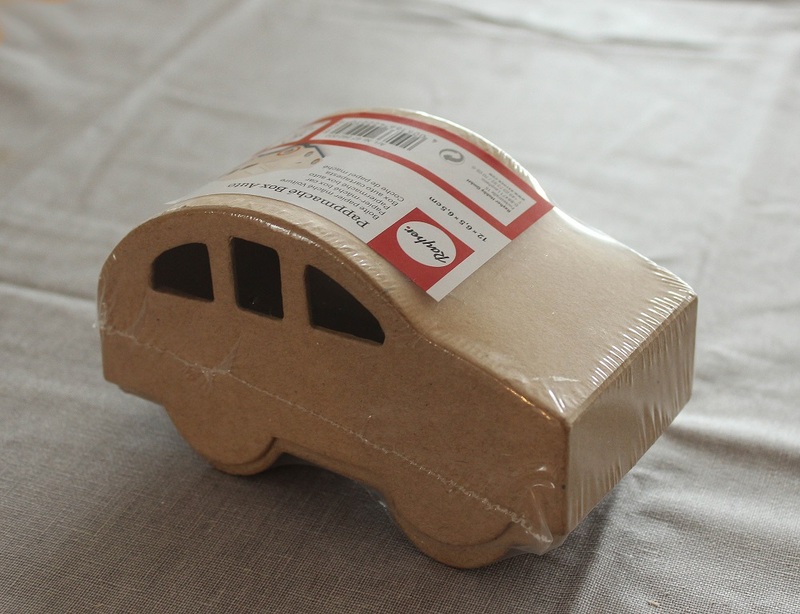 Det er mange som kjører opp og tar lappen, og ad er det utrolig hyggelig med en liten gave for å markere det. Her er det pyntet en liten pappbil, som også kan fylles med en liten overraskelse. Denne bilen er laget for Hobbykunst. 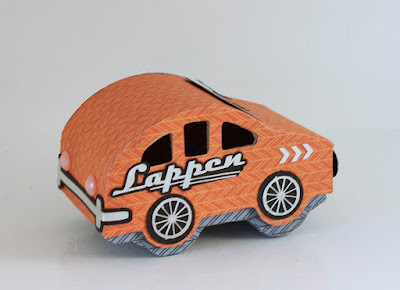 Her er det brukt to mønsterark fra Papirdesign. 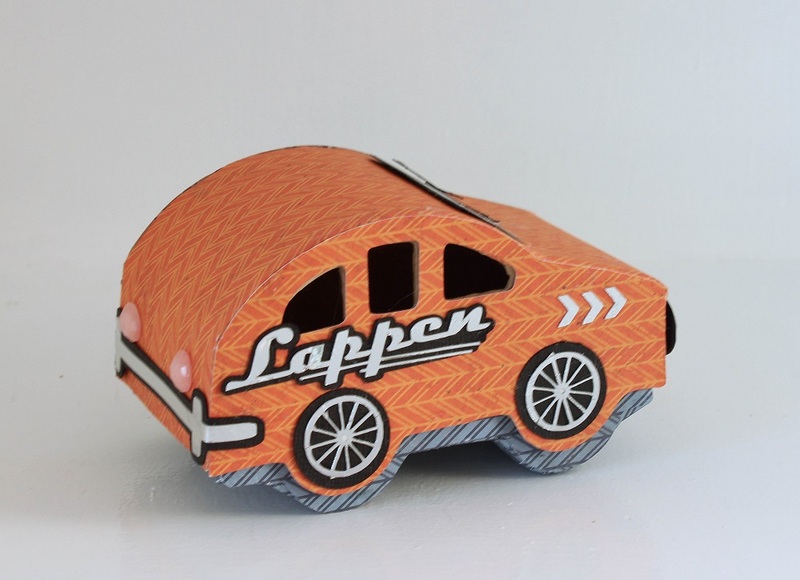 Det gråblå heter Jernvareavdeling og det orange heter Høretelefoner. 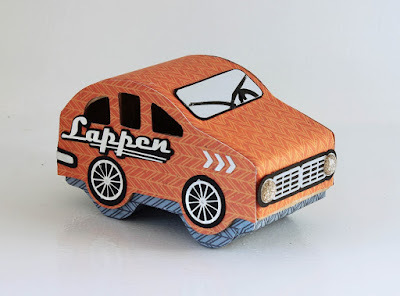 Jul, tekst og støtfangere er eget design og er kuttet med Silhouette i sort kartong og sølv kartong. 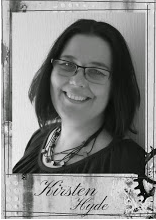 Lyktene er bling fra Prima. 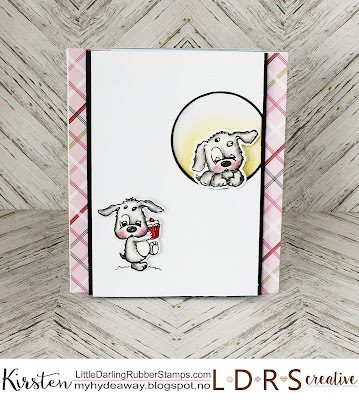 Hello everyone, and Happy Easter. 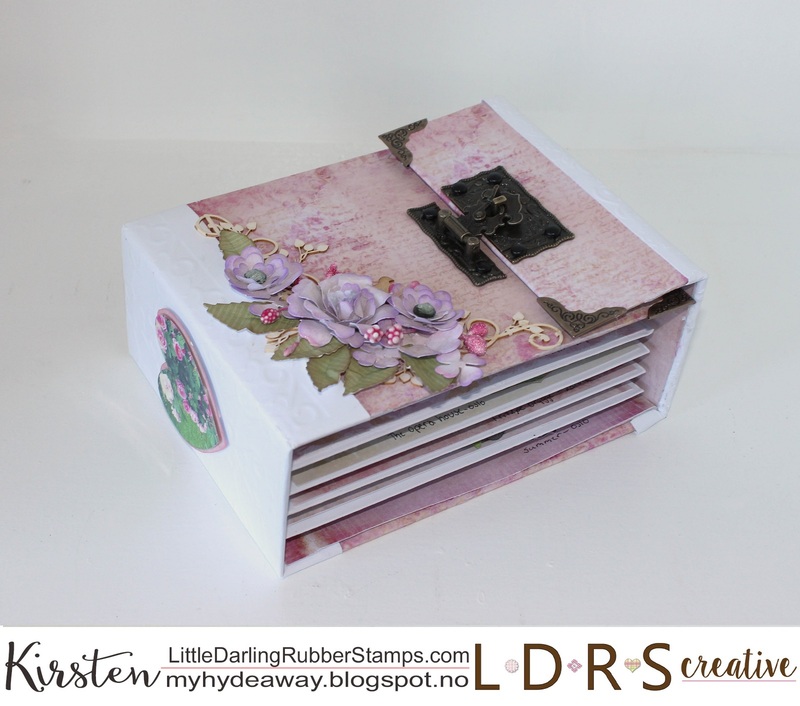 It is Kirsten here, showing a spring minialbum with the Time for Tea paper collection, photos from Norway and lots of dies. 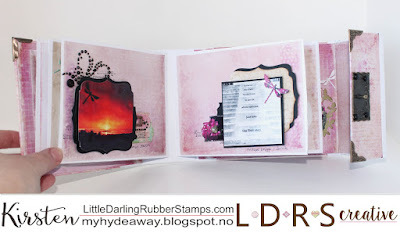 The LDRS dies are very versatile, and I wanted to give you some inspiration on how to use them in a minialbum. 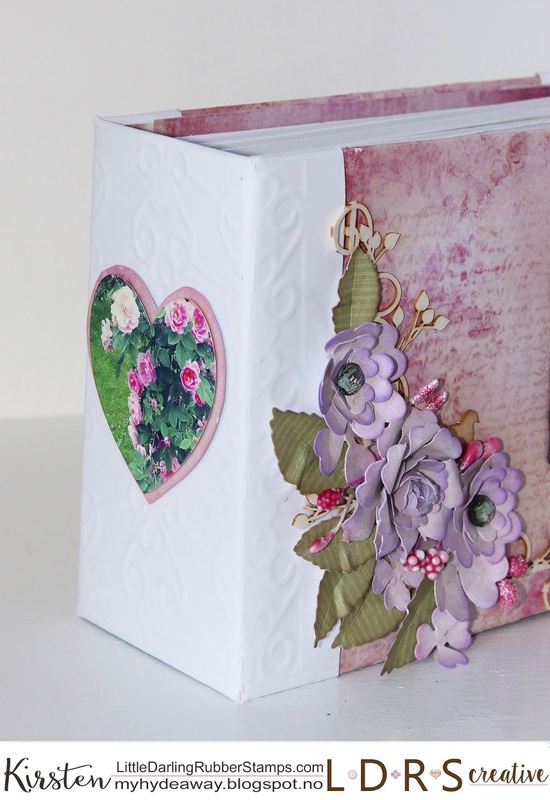 The flowers and the leaves on the front has been created using the Fancy flowers dies set. 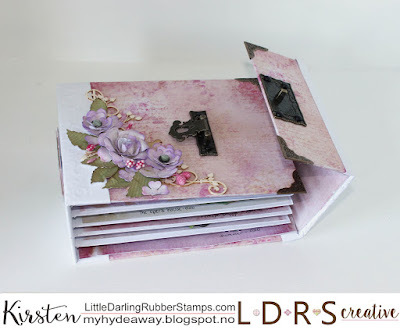 I also wanted to use one of the new dies as an embossing folder at the back of the album. 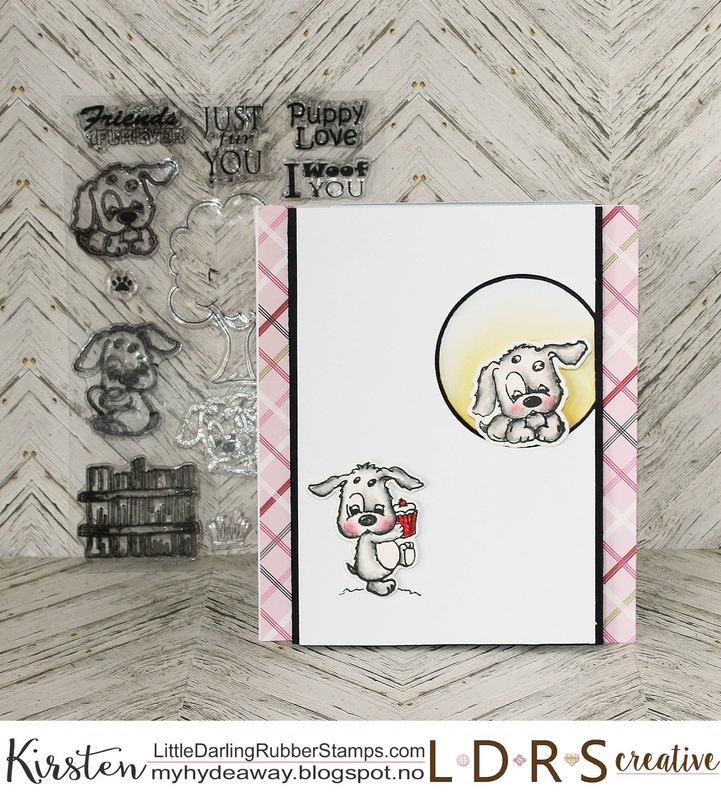 This was done by using by cutting two Lovelette dies cuts, gluing them together, and using this as an embossing folder on white cardstock. This works perfectly as an embossing folder. 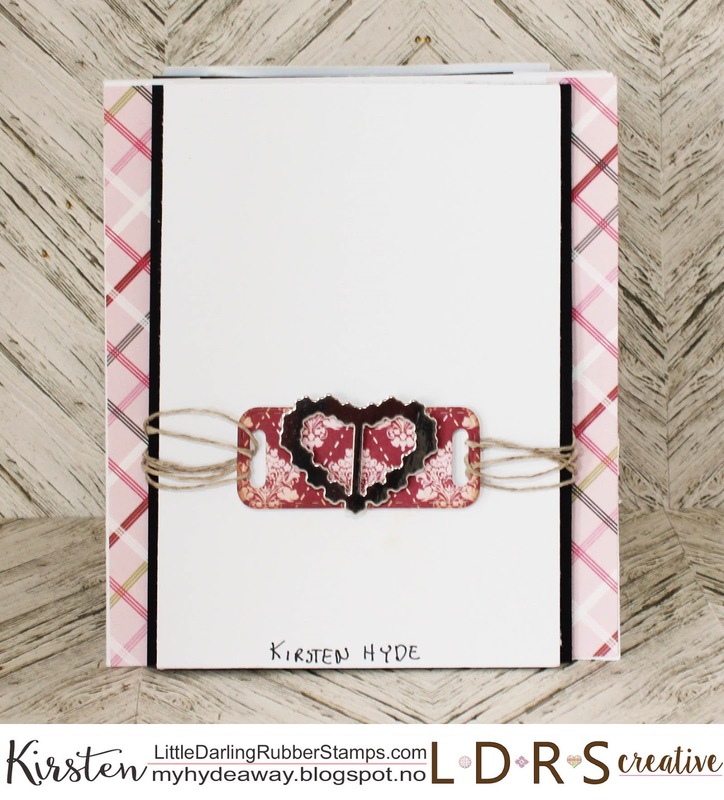 The heart has been cut out with the heart from the same dies set. 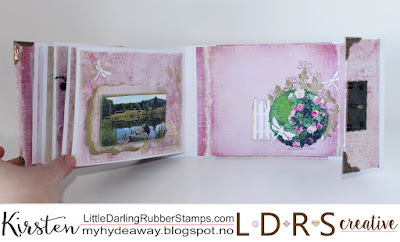 At the oppsite side, I used the dragon fly embossing folder from the Timeless embossing folder set. The album has five pages, decorated on both sides. 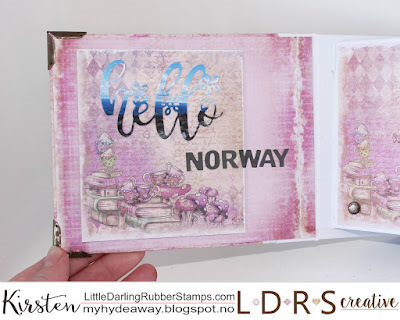 The first page is an introduction to the theme of the album, photos from Norway. 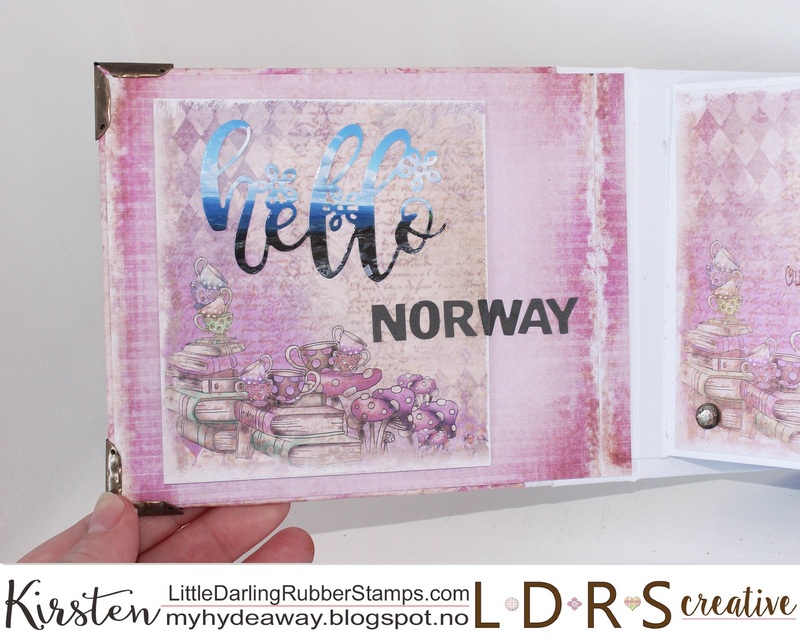 Hello, has been cut out from a photo of the mountains in Norway, using the Hello word die. I thought that using the die on a photo, would create a bit more impact. 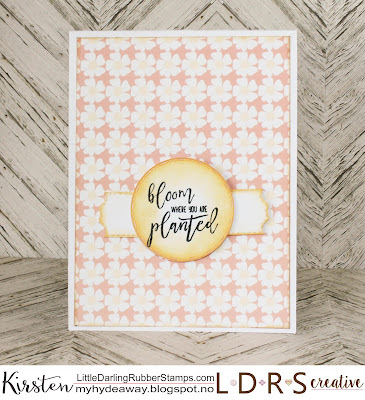 The flower photo has been cut out with a circular die from the fancy circle die set. 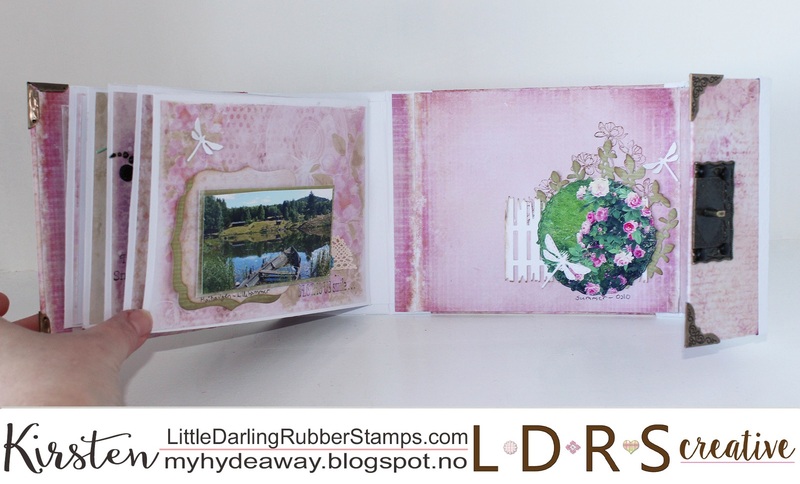 The fence and the dragon flies at the back is from the Allifair build a card die set. 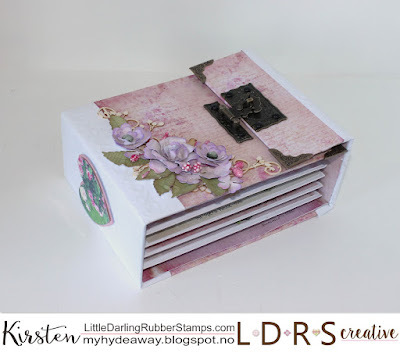 The flowers at the back, and the text stamps are from the Magnolia splendor stamp set. 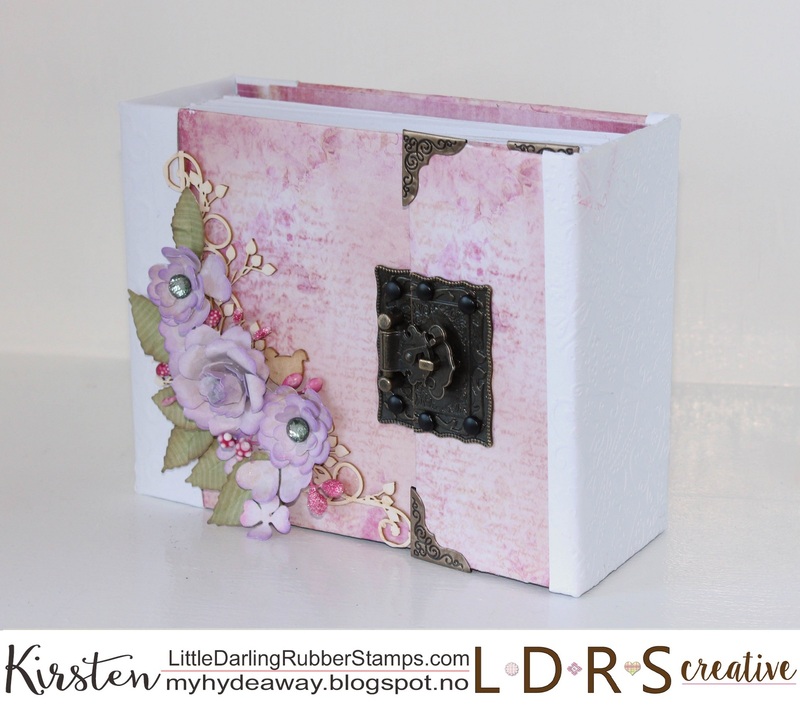 These stamps are fantastic to use as background stamps. These pages are showing Norway during the winter time. We have a long and dark winter in Norway, but it can be very beautiful. This photo is showing snow flakes on my car window a winter morning. I have used a die from the Fancy circle die set to cut out the photo. The back snowflakes have been cut with the qute Snowy day border die. 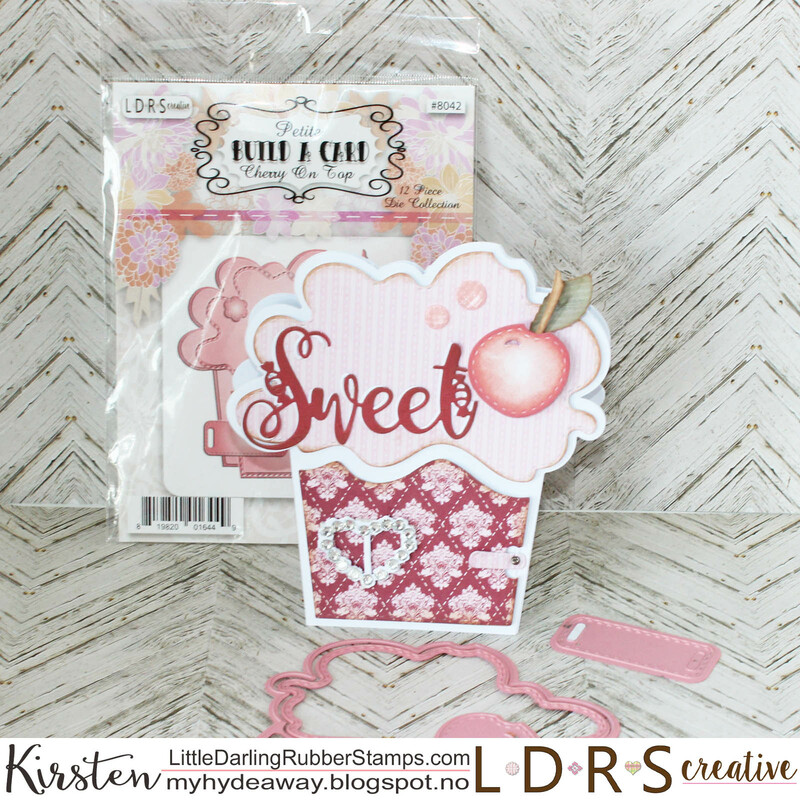 This die is fantastic for creating background patterns on those winter cards or layouts. This squirrel came up on my window last winter. 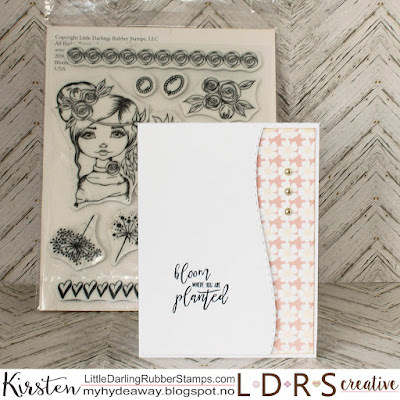 The photo has been cut using the Fancy circle die set and the tags has been cut with the tags from the Fancy Rectangles & Layers die set. 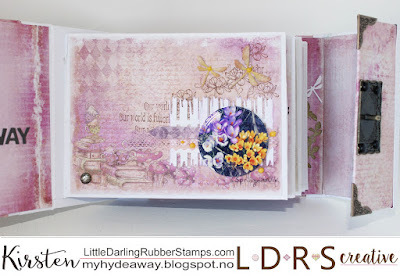 The background swirl stamps are from the Magnolia splendor stamp set. 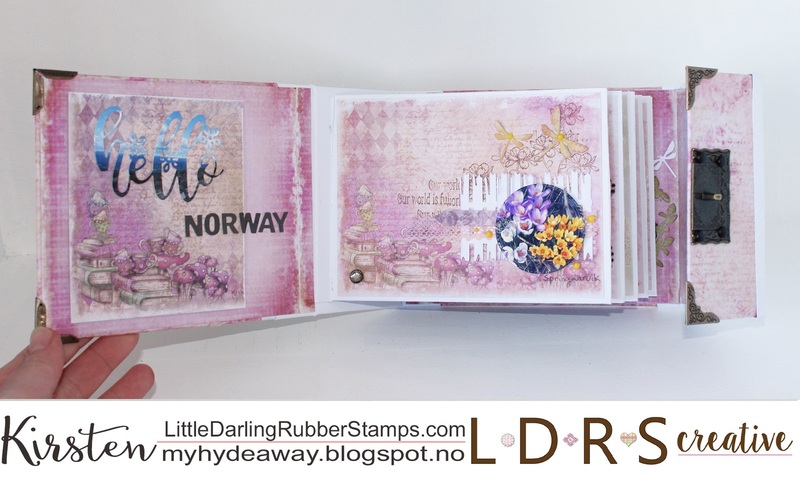 These two pages have photos from Oslo, the capital in Norway. 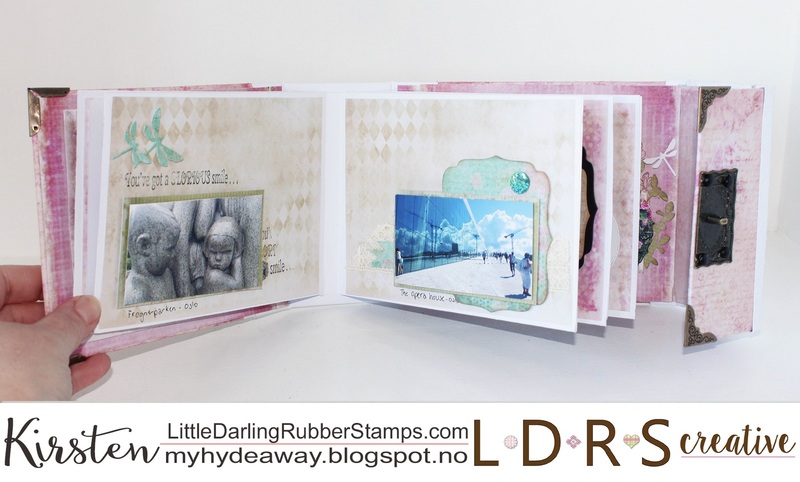 This shows a photo from Frognerparken, a park full of fantastic sculptures in stone. 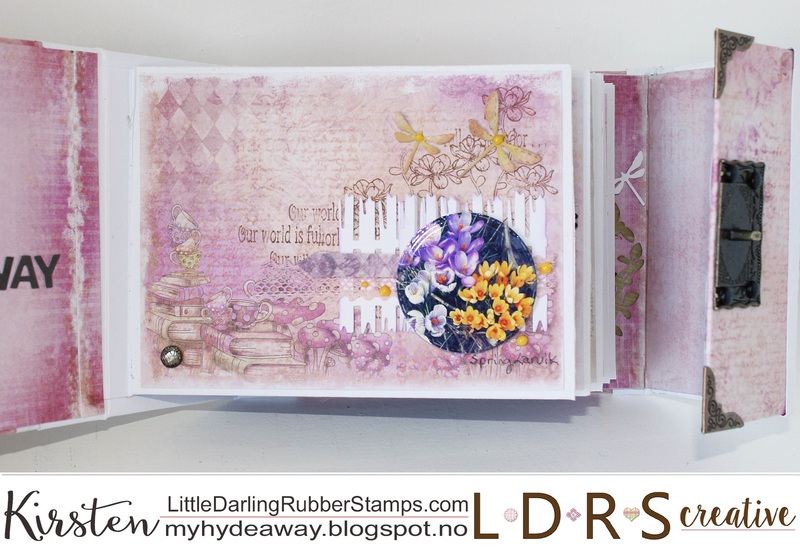 The background text stamps are from the Magnolia splendor stamp set. The dragon flies are from the Allifair build a card die set. This photo is from the new Opera house in Oslo, a fantastic building in stone and glass, where you can walk on the roof. At the back, I have used a die cut from the Regal frame die set. 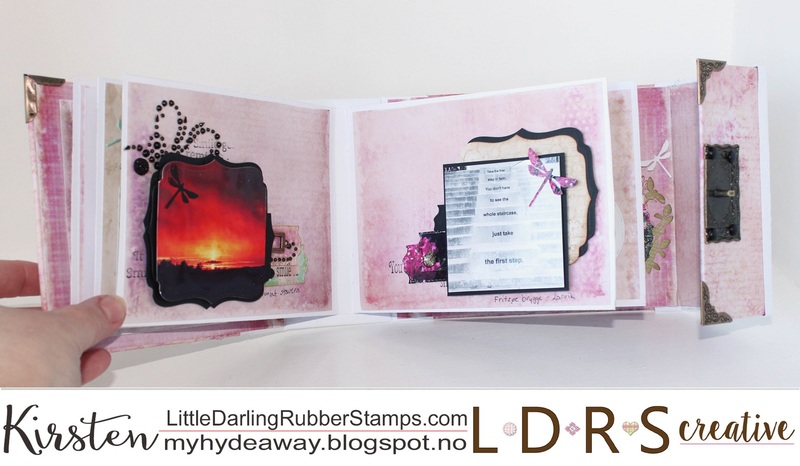 The next two pages have photos from Larvik. 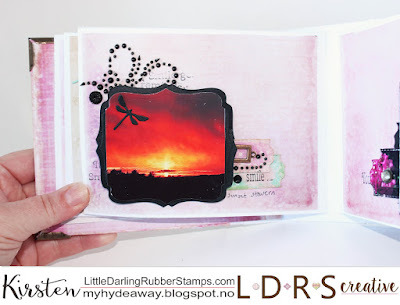 The first image is the sunset towards Stavern. The image and the black frame of the photo has been created using one of the dies from the Regal die set. 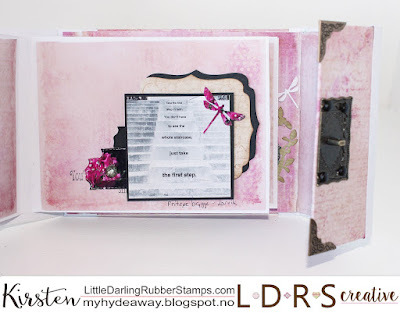 The tags has been created with the tag dies from the Fancy Rectangles & Layers die set. 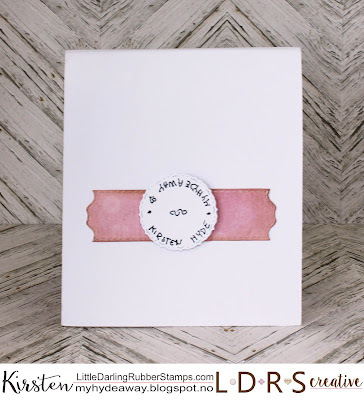 The background text stamps are from the Magnolia splendor stamp set. These stairs are from Fritzøe Brygge in Larvik. 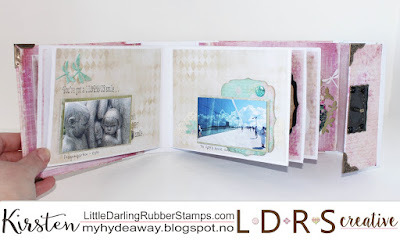 Larvik town has lots of poems carved in stone, all over the town. The tow background dies has been created with one of the dies from the Regal die set. The tags has been created with the tag dies from the Fancy Rectangles & Layers die and cutting the diecuts out of a photo. The dragonfly are from the Allifair build a card die set, but this dragon flie has also been cut out of a photo. 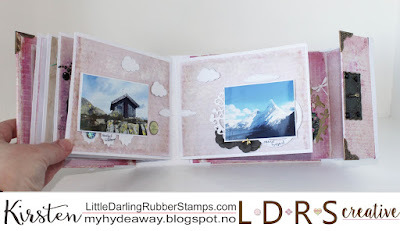 These two pages are showing a bit of the fantastic mountains we have in Norway. 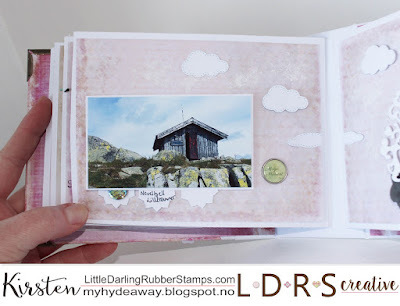 This is a little hut at the top of Nevelfjell in Lillehammer. 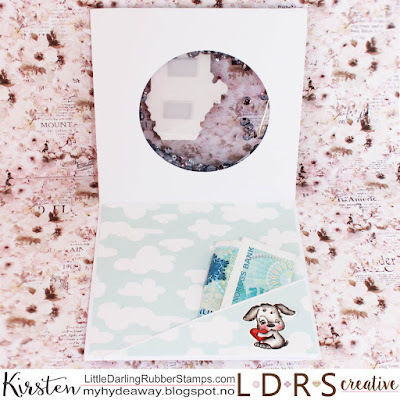 The clouds are from the Allifair Build a card die set. 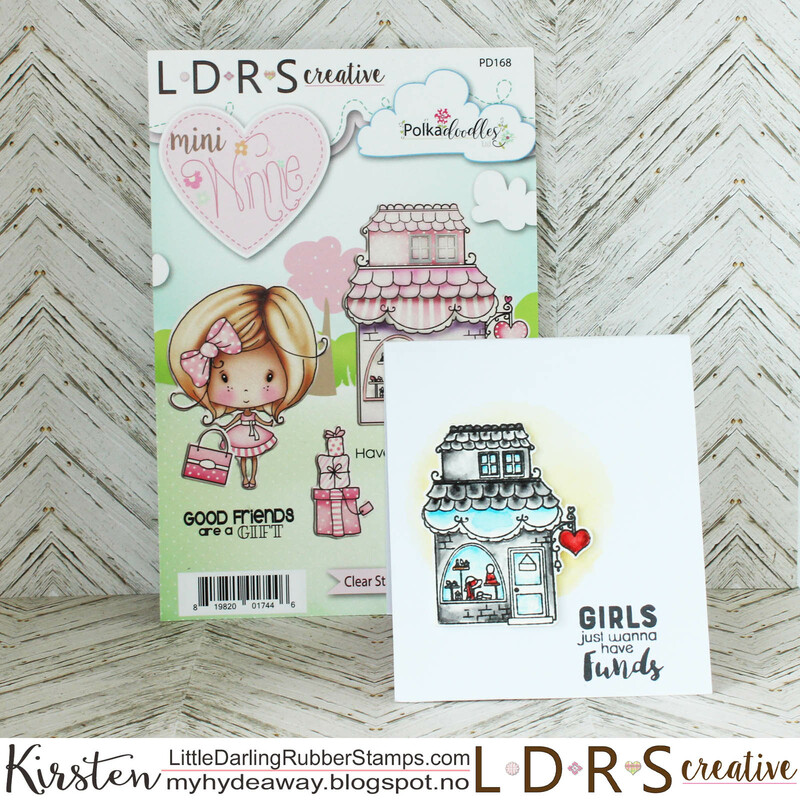 The little banner under the photo is a die from the Grace - build a card die set. 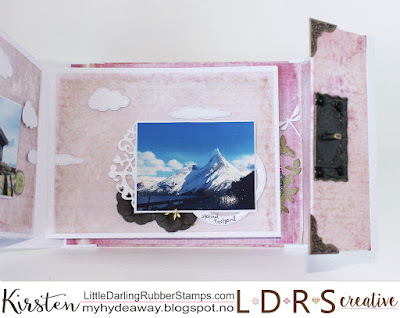 This photo is of Stetind, Norways national mountain. 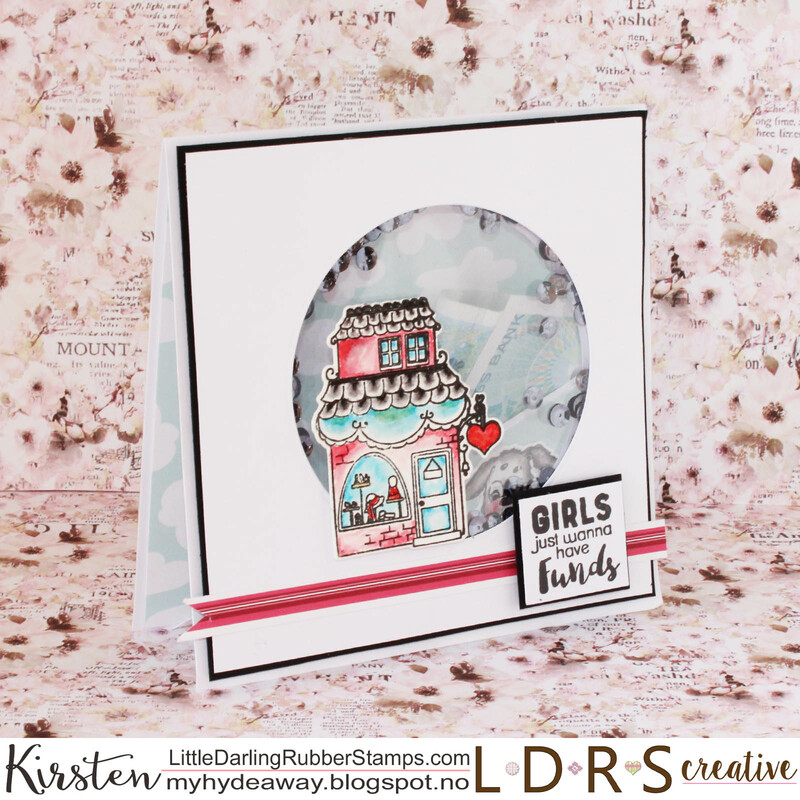 The background lace is from the Regal frame die set and the circles under the photo has been made using a die from the Fancy circles die set. 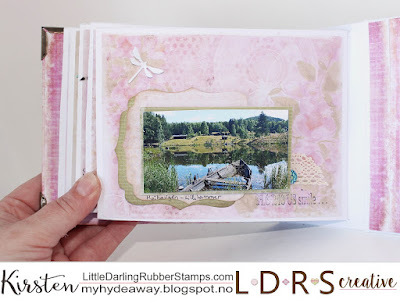 The last two pages are showing summer photos from Norway. 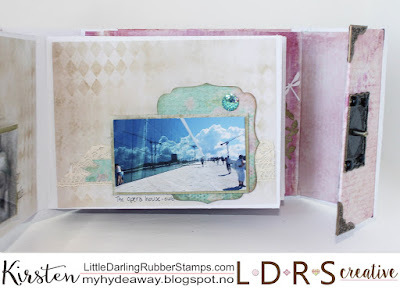 The last page is a photo from Oslo in the summer. The flower photo has been cut out with a circular die from the fancy circle die set. 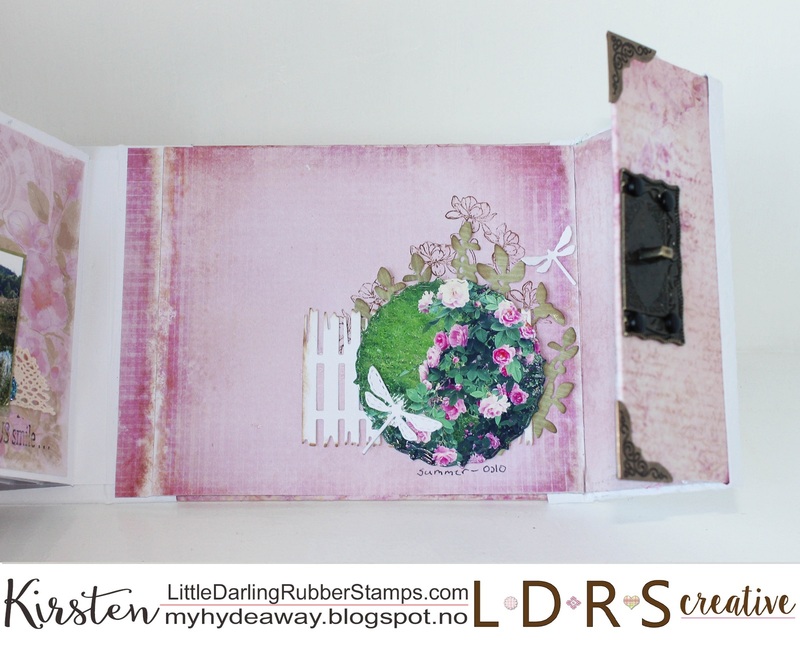 The fence and the dragon flies at the back is from the Allifair build a card die set. 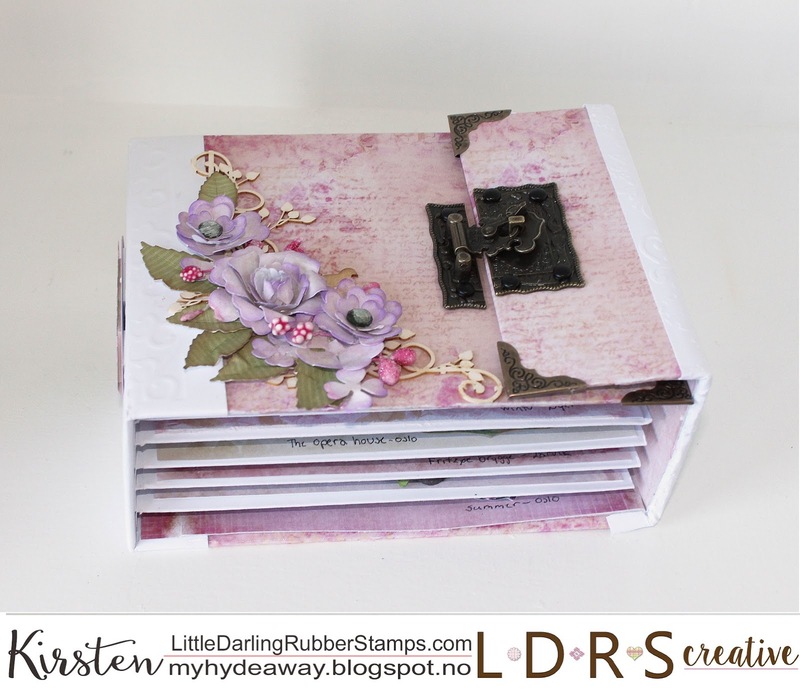 The flowers at the back, and the text stamps are from the Magnolia splendor stamp set. 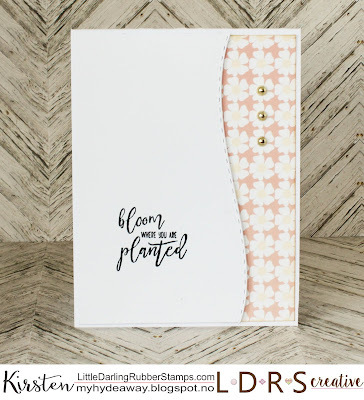 The green leaves are from the new Super Sprigs die set. 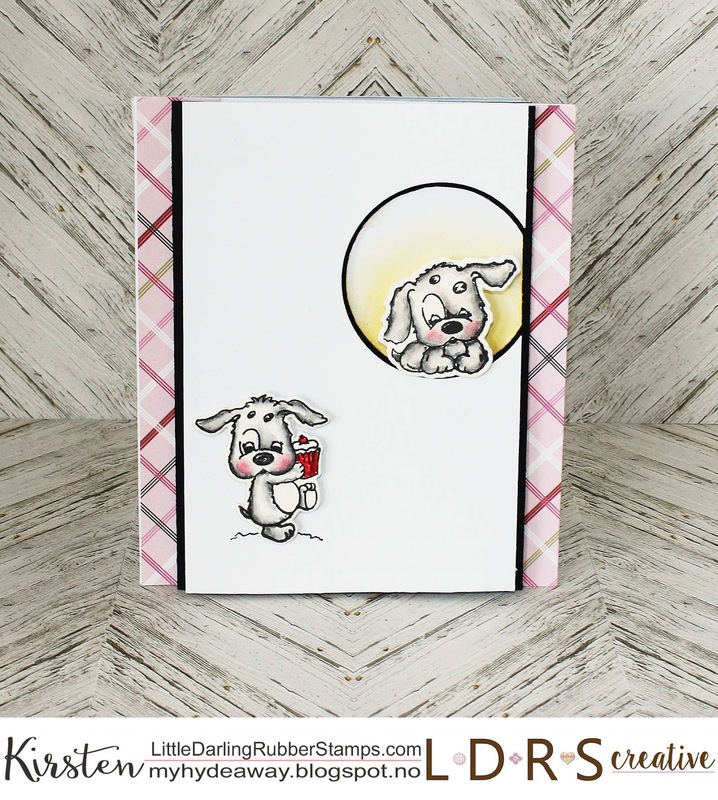 Wishing you a happy crafty spring.